Sixers Mailbag: Is panic over Philadelphia's underwhelming offseason justified? 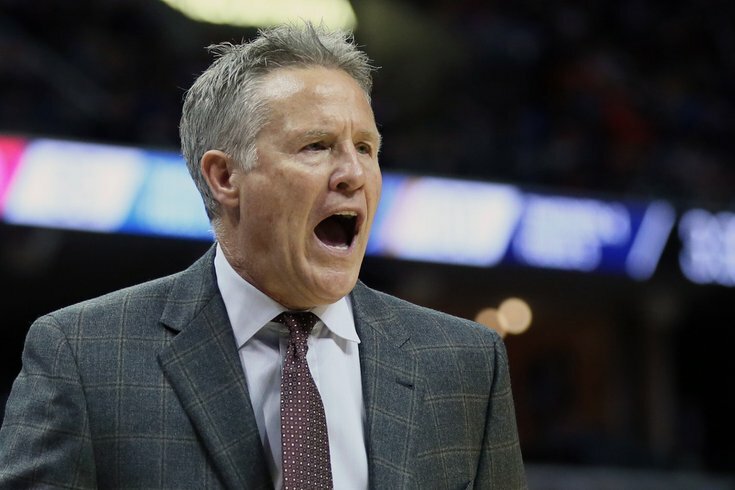 Philadelphia 76ers head coach Brett Brown reacts during the fourth quarter against the Memphis Grizzlies at FedExForum. The Grizzlies won 105-101. It's a storyline that has been beaten over our collective heads over the last few weeks in Philadelphia — a campaign that was supposed to be about "star hunting" ended without a single new star in tow, while rivals around the league loaded up around the Sixers. There would be no LeBron James, no Paul George, no Kawhi Leonard, just Wilson Chandler and some other complimentary pieces. What are the ramifications of the Kawhi Leonard trade for the Sixers? What looked like a defining offseason pivoted into the "kicking the can down the road" Sam Hinkie's critics accused the former GM of doing. Rather than make any significant investments, the Sixers decided to let things happen around them, focusing on small upgrades rather than big commitments. Barring an earthshattering deal falling out of the sky in August, Philadelphia's roster is nearing its final form with roughly two months to go between now and training camp. The spine of a 52-win team remains in place, but after exiting the playoffs in five games against a depleted Boston Celtics team, it's fair to wonder what to expect from the Sixers in the coming year. And plenty of people have that exact topic on their brains as we enter the dog days of the NBA offseason. So it's time to take some mailbag questions on that subject, plus a whole lot more. Everyone is upset we didn’t pull in a big name FA. Why aren’t fans realizing a second year Simmons, embiid coming off a healthy offseason, and a healthy Fultz is a great place to be in? I think the reason here is quite simple. Expectations were built up by the chatter and possibilities this offseason, and now that none of them have come to fruition there has been a natural letdown among fans of the team. Let's say you have a perfectly good luxury car in your garage, for the sake of the discussion we'll call it a BMW. It's new and exciting to you, you really look forward to driving it, and it's likely to make you happy for some time to come. Then all of a sudden, you're told by a loved one that they might be able to get you a Ferrari without you needing to do or contribute anything. Your hopes get up, and right as you expect you're getting this extra car the deal falls through and you're left with what you started with. Not getting the new car doesn't have any material impact on the old one, but the shift in expectations does make you feel disappointed. It's a normal human reaction to get upset when something that looked like a real possibility falls apart, even if it was something of a bonus in the first place. Some important distinctions, of course: the young players on the Sixers are human beings, not commodities, which is important to note on a human level. And unlike anything else you could use in this analogy, people like Ben Simmons, Joel Embiid, and even Markelle Fultz are expected to improve over the short and long-term. Their ascent to stardom (or even competence, in Fultz's case) shouldn't be taken for granted, but players with their skill level at such young ages tend to continue growing well into their mid-to-late 20's. Watching their development paths unfold is an exciting prospect, and having two prospects at the level of Embiid and Simmons developing at the same time is pretty unprecedented for the Sixers. If you're the sort of person who can key in on that and wants to believe nothing but internal development can push this team forward, good on you. "There seemed to be an acceptance that, we declared our hand, this is what we're going to do, and for the most part we've kind of done it," Brown said of the rebuilding years. "If that portion of the fanbase is still prepared to take this notion [of doing it organically] and that's going to equal a championship, it's noble but I don't agree with it. I think another high-level free agent is required. I feel like we have the ability to attract one... I think we treat people well here, I think it's a great place to come in and be a part of a culture and a family." In the team's own words, requirements haven't been met yet. And so while there is time and development left for nearly all of Philadelphia's core, it is completely legitimate for fans to take issue with how the offseason played out. How does the bench compare to what they had 1st half of last year, (1) with and (2) without Fultz with a functional jump shot? The bench should be significantly better than it was to start last season, and some of that is just an acknowledgment of how bad it was to start the year. Philadelphia's horrific bench play was part of why their starting lineup's NETRTG numbers, among the league's best for the majority of the year, ended up looking as strong as it did. Think about this — there were real expectations for guys like Timothe Luwawu-Cabarrot and Jerryd Bayless to make an impact off the bench when last year opened. For reasons that are both similar and dissimilar, each proved they were not fit to be part of a rotation for a team with playoff aspirations, and they were eventually fazed out by the time the Sixers went on their brilliant stretch to close the season. Another important factor to make note of, even if we exclude additions like Mike Muscala and Wilson Chandler, is how badly Markelle Fultz's absence screwed up Philadelphia's plan last season. The Sixers went into last season expecting to depend on Fultz for scoring and shot creation, and because his development was a huge priority they didn't exactly approach the offseason thinking a high-level backup plan was necessary behind him. T.J. McConnell did an admirable job filling that void, but he has limitations to his game that were never going to allow him to make up for the loss of Fultz. If Fultz is even 75 percent of what many expected him to be coming out of UW, that is a massive lift for the Sixers. They have no one else on the roster with the blend of skills he has as a shot creator and scorer, and the game will open up for his teammates the better and better he plays. In a hypothetical world where he doesn't recover his jumper and the questions still exist about his future, that equation obviously changes a lot. Philadelphia gains shot creation, sure, but they are in desparate need of a pick-and-roll handler who teams have to respect as a shooter. Their ceiling as a team is capped to a degree until they add that element in some way, to say nothing of how Fultz's presence would impact floor spacing overall. Either way, sprinkle in more shooting from the bench than they had to begin last season and a bit of extra lineup versatility provided by Chandler, and you're looking at a team closer to the unit that ended the year than the one who opened it. I'm not sure the Sixers' win ceiling is much higher than what they hit last season regardless of which outcome Fultz trends toward — young players are too inconsistent to bank on him being a net positive night in and night out — but 50+ wins could still be achieved with a more reasonable in-season trajectory. Do you think the Sixers might be interested in Jimmy Butler this year or next? People forget this now, but there were reports that Jimmy Butler had a meeting scheduled with the Sixers the last time he was a free agent, way back when he was still in Chicago and the Sixers were run by Sam Hinkie. Given where they were at that juncture, I think it's fair to say there might be mutual interest on both sides to explore a partnership. Butler isn't the perfect fit on Philadelphia's end due to his high-usage tendencies and his average outside shooting, but he would be a massive upgrade on everybody else they have on the wing. He's capable of running your offense, a tremendous defensive player, and a hard-nosed competitor who would demand the most out of everybody around him. That last part may be why Butler would consider coming here at all. Rumors have swirled that he's not content with the commitment of the Wolves' young core to winning, and he might mesh better within a team that has made defense their calling card. Embiid may be a bit of a joker away from the game, but there have never been any doubts about his competitiveness and willingness to do what it takes to win. My guess is that the Sixers would prefer a cleaner fit if they had their choice of the 2019 free agents, but Butler will certainly not be sneezed at if he wants to join Philadelphia's young core. Considering Boston is the #1 obstacle to title aspirations, wouldn’t a blank check approach to Mike Zarren be logical, as he’d seemingly know their short and long term strategy? I don't think this is the right way to think about potentially hiring any GM, Zarren included. Unless Zarren is sitting on some secret developmental trick that turns all draftees and free agents into the best possible versions of themselves, I'm not sure what knowledge of Boston's future would be all that valuable to Philadelphia improving their own. Consider this: even if the Sixers learned, for example, that the health of Irving and Hayward was dubious on a long-term level, that's still information that is nearly impossible to act on. As much as we like to pretend health is a certainty one way or another, we're still ultimately dealing with percentages. Team building at a high level has a built-in assumption that your competition is always going to hit the highest-end outcome. We've also seen time and time again how quickly the balance of power around the league can swing. When the Oklahoma City Thunder went to the NBA Finals in 2012, most people would have expected them to be a fixture there for the foreseeable future. By the same token, no one would have predicted Golden State's ascent back then. Yes, Boston looks primed to be Philadelphia's primary competition in the East from a bird's eye view, but it's too early in the careers of Philadelphia's core to have tunnel vision for one opponent. Zarren would bring a lot of strengths to the table, including a future-focused mindset, expert knowledge of the ins and outs of the NBA's collective bargaining agreement, and presumably other things that the public will never really be privy to. Hiring one of the perpetual top names on the market would be a positive move by any stretch of the imagination. Hiring him strictly for Boston intel, however, would be a fool's errand. Is all the panic from the majority of Sixers fans for nothing? Will Philly be able to replicate or even improve upon last year’s post all star break success with Fultz on his game and the loss of Belli and Ilyasova. Similar to the opening question, I don't think the Sixers will be able to replicate their post All-Star break success. But that is more about how unprecedented that run to close the season was than anything about how good the team will be this year. I know it felt like Philadelphia would never lose again after the Eagles won the Super Bowl last February and the Sixers went absolutely bonkers down the stretch, but there will be growing pains again this year. That's okay! Philadelphia is loaded with young players who will need to figure out how they all can be the best possible versions of themselves around one another. It would not be surprising to me if the Sixers won 52 games again this season, only they did so at a steadier, more sustainable pace than the one they closed the season at. It's unlikely they'll play as many bad teams as they did during the season's stretch run last year, but they will almost certainly be better and more consistent to begin the year. 1. What is the ceiling for this team now as currently constructed? 2. Do you see a trade for another player happening before the season? Let's focus on question No. 1: the ceiling of this Sixers team is an appearance in the NBA Finals, full stop. That's not necessarily the realistic outcome, but there is absolutely a world in which they come out of the East next season. Embiid is already an All-NBA player, and Simmons was not that far off as a rookie last season. Development and improvement is coming elsewhere, of course, but a healthy offseason for Embiid especially might be the key to the Sixers hitting heights previously unreached by this group. Entering the year with an improved fitness base and an entire summer to work on his skills is a game changer for Embiid, who has shown rapid improvement even when his windows to practice were few and far between. Leonard's arrival in Toronto changes things and there are certainly other competitors for this crown, but it would not be unrealistic to say Embiid could be the best player in the Eastern Conference in short order. He is dominant on both ends of the floor at his best and makes the game easier for everyone else around him. Philadelphia's ceiling may hinge harder on Simmons' development because his complete ineffectiveness against Boston in the playoffs was the biggest change between round one and round two. The Sixers will have more outs this year if Simmons' jumper is a playoff problem — assuming Fultz gets right — but one of their building block pieces can't be totally anonymous if they expect to challenge the East's elite for the conference crown. If we're strictly talking what their peak could be, I think it's fairly obvious. It's just a matter of putting it all together at the right time, and overcoming a Boston team that has a deeper, more versatile core than they do currently. Tall task, but ultimately not impossible. Do you think Ben Simmons will ever make more than 20 3-pointers in a season in his entire career? Frankly, we don't have a lot of evidence that he even wants to take them, let alone make them, so this is basically complete guesswork. But unless Simmons is too proud to acknowledge his need to improve as a shooter — which I don't believe is the case — I think long-term he almost has to reach a baseline of competency from beyond the arc. So I'll say yes, with the acknowledgment that I have about as much insight to this as any of you do sitting at home.